The first day of the two-day BLESS Springing to Life event occurred on April 15, 2006; the second on April 22. 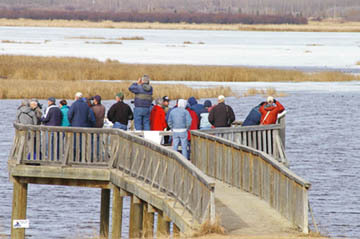 Approximately 35 nature lovers showed up at the BLESS Birding Platform overlooking Big Lake on the first Saturday morning. Many had come from Edmonton and were glad they did. 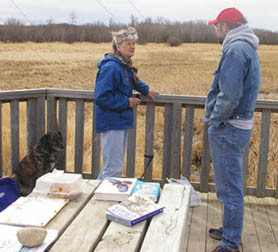 A surprising variety of bird species were there to greet them and many of the birds were at closer viewing range than normal. The lake was still mostly covered in ice and the open water was available only relatively close to the platform. So, the water birds stayed closer for visual enjoyment. The Springing to Life event is hosted by a number of BLESS members who are extra-keen on birdlife. 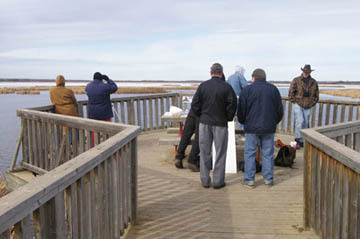 The annual event celebrates the return migration of birds to Alberta and especially Big Lake and beyond. Compared to the results of 2005, bird numbers were down, 1,786 in 2005 vs 424 this last Saturday. The decrease may, in part, have been due the extensive ice covering on the lake. But, species numbers were up significantly from 24 in 2005 to 31 this last Saturday. So what were the notables? 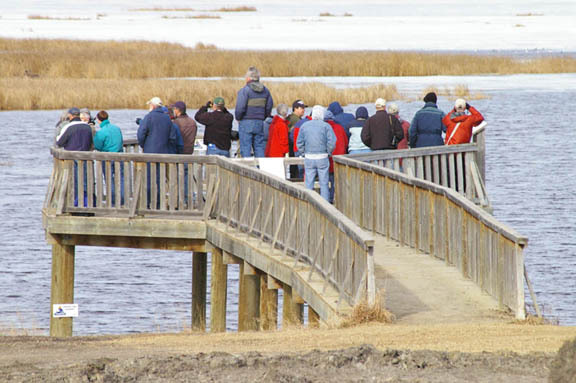 In the "big bird" category, around 70 Tundra Swans, four Trumpeter Swans, 35 Canada Geese and one Great Blue Heron were spotted from the platform on or over the lake. Ducks were extremely well represented with Mallards, Common Goldeneye and the beautiful Canvasback being tops in numbers present. Special pleasure was taken in the return of the first of six Red-winged Blackbirds, a pair of Horned Grebes, a single Killdeer and three Franklin's Gulls, the latter having completed a marathon birding adventure probably bringing them from as far away as Chile in South America.